I found the picture of this pretty, little seashell on the free photo sharing site Pixabay. Fortunately the author included the scientific name of the shell so I could search for information on the Bufonaria perelegans. First I looked in both of my seashell identification books and only found shells that resemble it. It is NOT a Florida shell. This mollusk lives in the Pacific waters near the Philippines and Indonesia. I believe it grows to 3 inches in size. All the little bumps make this shell interesting. It has a golden caramel yellow color with some white inside. And the fact that it has little spikes assures us it’s not a common nutmeg. The Frog shell (Bursa rhodostoma) is similar and can be found in Florida. They are of the “family” Bursidae, and if you’d like an idea of how many varieties of shell there can be in this one family, please look at this page at the Natural History Museum Rotterdam. It’s why I can’t respond to readers who say things like, “I have a little yellow shell, do you know what it’s called?” I’m no expert, and I can only suggest getting yourself a good reference book with nice photos. Even then, you may not be able to exactly identify the shell you find. 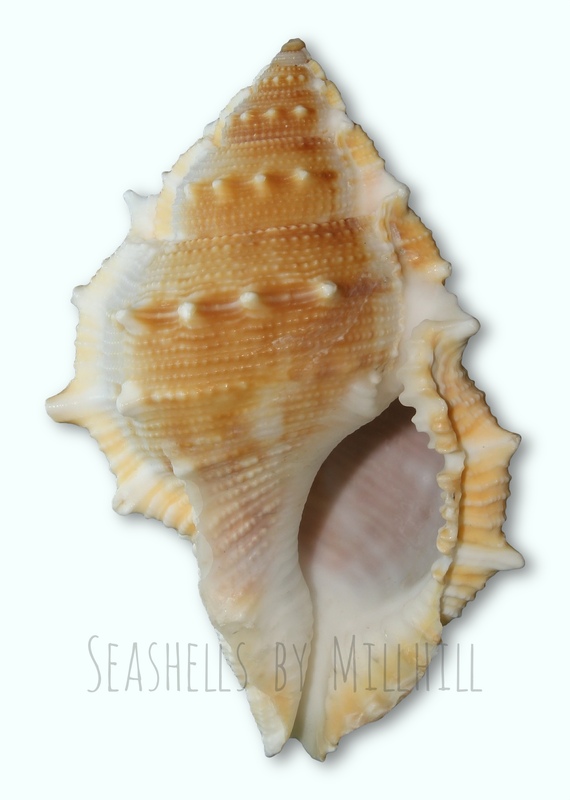 See more info about this pretty little seashell at Wikipedia. I think I have seen this seashell in Indonesia and the Philippines. it is quite common seashell there. Thanks so much for the info – I check the website of the Rotterdam museum – they do have good info on seashell! It’s funny how some shells are so common in certain places and in other parts of the world we never see them. It’s wonderful when people share their information (and photos) online. Thank you for contributing!